CrystaLaser designs and manufactures cost effective ultra-compact diode-pumped Nd:YAG, Nd:YVO4 and Nd:YLF crystal lasers. Our lasers feature with low noise, high stability, high efficiency, high reliability and excellent laser beam quality. The specific designed compact Q-switched laser with low jitter is great for LIDA application and the Q-switched IR, green and UV lasers are suitable for laser trimming, marking and micro machining application in semiconductor inductry. These lasers are suitable for OEM, scientific and industrial use. Current available Q-switched laser products include diode-pumped solid-state Nd:YAG, Nd:YVO4 and Nd:YLF Q-switched laser systems. Single longitudinal mode (SLM), single transverse mode (TEMoo), Q-switched laser is availible. Please contact CrystaLaser. Compact Q-switched green laser up to 1 W are availible now. No cooling fan, no cooling water required, no noise and no vibration during laser operation, plug and play. The diode-pumped Q-switched crystal lasers are based on our proprietary laser cavity technology. This new technology allows the Q-switched crystal lasers to operate in TEMoo mode with amplitude stability and extremely low power consumption in a ultra-compact housing. If you need special configurations, please contact CrystaLaser directly. 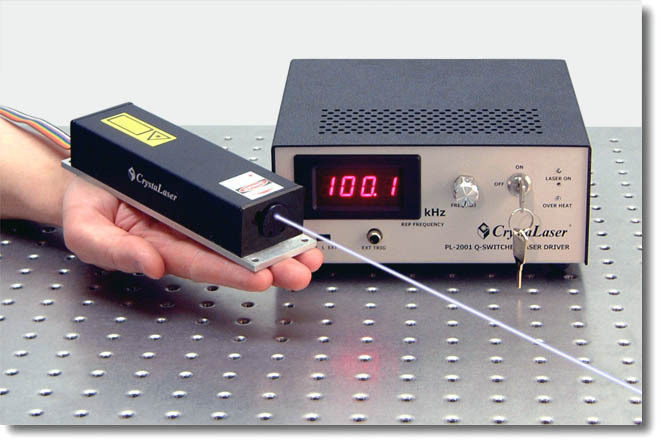 355 & 266 nm lasers at 15kHz;    Nd:YLF lasers, 1047/1053 nm, rep.
rate at 15kHz, 527 & 523 nm rep.  rate at 8kHz;  349, 351 & 262 nm lasers at 4kHz. 0.05mJ for 349&351 nm lasers, respectively. after shipment for all of the Q-switched lasers.